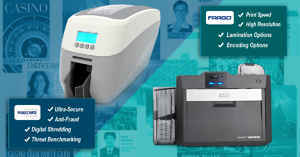 Home » IDSecurityOnline Blog » In-House or Outsourced Printing � Which Is Right for You? In-House or Outsourced Printing � Which Is Right for You? If your organization has a need for ID cards, you have two basic options � printing them in-house or outsourcing the project to a printing company. Both of these choices will ultimately provide you with cards you were looking for. However, if you are looking for a cost-effective solution to get professional badges, in-house printing definitely makes sense. With in-house printing you are in control of the entire process from start to finish, which is beneficial for a couple reasons. For one, you don�t have to worry about receiving a low-quality or inferior finished product � you have the ability to monitor the progress of your ID badges every step of the way. Plus, in-house printing allows you the luxury of making beneficial changes to the process. For example, perhaps you do an ID test printing and find that the cards are simply too flimsy and susceptible to wear and tear for your organizational needs. With in-house printing you have the option of doing these �test runs� to get everything perfect before you begin printing en masse. If you went with an outside company, you might not have that option. Or, the company may not be willing to deviate from their set system to accommodate your specific customizations. Also, in a case of a lost ID, you can issue a new one instantly instead of ordering it and waiting for this badge to be ready. The same logic applies to new employees or students. When you choose in-house printing you don�t have to worry about sensitive information leaving the organization. 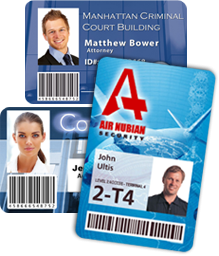 ID cards are often a matter of security, and by electing to print in-house, you don�t open yourself up to potential risks from outside sources � you always know exactly who�s seeing what information. Card printers are now very easy-to-use. 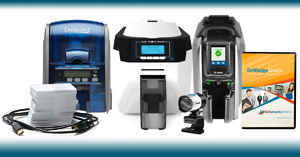 They are plug-and-print solutions that require no specific training. Creating badges is also pretty straight-forward and does not require any design skills. Manufacturers also made it easy to load cards and ribbons and maintenance is minimal. 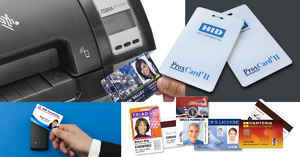 If you purchase an ID card system, you will get in one box everything that you need to print your cards within minutes. A bundle typically includes ribbons, cards, a camera and ID card software. 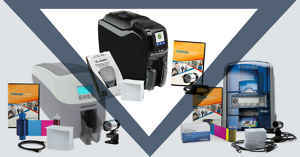 When you choose an outside printer your expenses are initially less than if you went with in-house printing because you don�t have to worry about the cost of buying a printer. However, over time, outsourcing becomes less cost-effective, while in-house printing becomes more. This is because, as well as factoring in maintenance and supply costs, an outside company will have to charge some level of additional mark-up in order to make a profit. Eventually these mark-up costs will surpass the price of an ID printer, at which point you�re losing money by choosing to outsource. 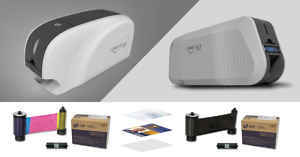 When you buy an ID card printer, you are looking at a very low cost-per-card � between 20 and 50 cents. If you print hundreds of cards, you will definitely break even very quickly and cover the cost of your printer in no time. Call ID Security Online today at 800-897-7024 to get a free consultation and find out which ID card solution is right for you.